Getting Started with DSLR Photography 3rd edition. Just bought a digital SLR but have no idea where to start? The team at DSLR magazine are on hand to help you get to grips with the various types of digital SLRs available and master your cameras functions and settings. Updated to include the latest camera technology, subject-based techniques and accessories, this MagBook covers all essential bases… including aperture, shutter speed, ISO ratings and exposure, as well as advice on more ambitious professional techniques and inspirational ideas for you to test out once as you learn. 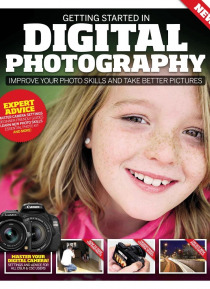 With advice spanning all areas of photographic scenes – from portraits to nature and landscapes, as well as guides to with key accessories such as lenses and flashguns, this MagBook is invaluable for beginners and amateurs looking to become a better photographer!